You know it is a good day when you get your mail and there are no bills or letters from the IRS, but there is a rare book catalog to leaf through that night. Brian Cassidy, a rare bookseller based in Monterey, issued his first catalog this month. Monterey and the Big Sur area have a strong tie to the Beats, particularly Jack Kerouac. Jerry Cimino’s Beat Museum, now just down the street from City Lights and Vesuvio’s, was located in Monterey for a while. I traveled to Monterey for a wedding over five years ago and the museum was closed, but I did get a cheeseburger at a roadside restaurant, Nepenthe, on Route 1 overlooking the cliffs and water at Big Sur. Kerouac supposedly raved about this particular cheeseburger in paradise. Monterey is John Steinbeck country, and Cassidy’s bookshop is located within the Cannery Row Antique Mall. Cassidy’s catalog and those in the works have a strong helping of the Kerouac, the avant garde, the counterculture, and Steinbeck. In the Bunker, I have been commenting on the return of the catalog to the bookseller’s arsenal of selling tools. The personal touch is back. Hopefully, many more booksellers, like Cassidy, will venture into publishing a catalog. Cassidy gets off on the right foot with his effort. Only 40 items are offered, but there are some exquisite selections. The design is simple, but the descriptions of the items and the black and white photographs make this a keeper. The bibliographic and literary details transform this catalog into more than your average affair listing prices and condition descriptions. In spots it is a literary history resource. 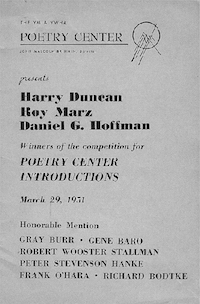 The entries on John Cage, Ted Berrigan, and Frank O’Hara provide interesting bits of information on little-known works. 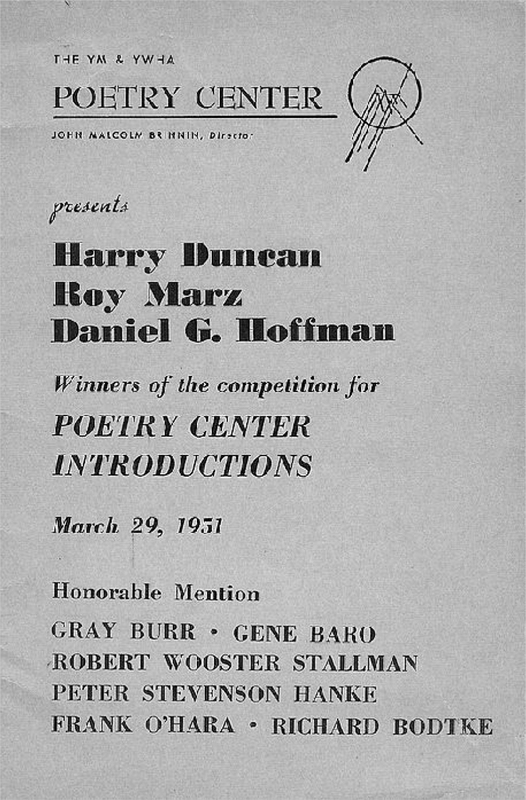 The piece of ephemera commemorating an early poetry prize won by O’Hara in 1951 is a case in point. This detail escaped the eye of Brad Gooch in his biography of O’Hara, City Poet. One of the main reasons I am focusing on Cassidy’s catalog is because its centerpiece is a Burroughs item: a one-page letter to Allen Ginsberg from 1969 discussing the E-Meter and Scientology along with a four page manuscript on the E-meter featured in Allen DeLoach’s Special Burroughs issue of Intrepid. As I have mentioned before Burroughs letters and manuscripts from the 1950s and 1960s just do not turn up every day (if at all) and letters to Ginsberg, one would think, are all in institutions, like NYPL, Ohio State, or Stanford. The letter originates from the DeLoach stash that has been trickling out on eBay and into bookseller and collectors’ hands for what seems like years now. The provenance is tip-top. The price is steep: $25,000. We can debate whether this price is accurate, but clearly for the high-end collector a Burroughs letter and manuscript are at the top of the food chain. At the Blair Sale, manuscripts were selling for around $5000 (“The Goat God” piece for Oui and “The Mayan Caper” from Soft Machine). A manuscript to “The Invisible Generation” for the International Times sold for roughly $4500. The E-Meter manuscript is probably in the $3000-$4000 range. Burroughs’ Peru Notebook sold for over $17,000 at the Ginsberg Auction. I do not remember off the top of my head seeing a letter to Ginsberg ever come up for auction or sale in the last decade. In fact, letters from the 1950s and 1960s just are not available. I would guess that substantial letters, and this is one, are in the five figure range, near in price to the Peru Notebook. That would place the letter and the manuscript in the neighborhood of Cassidy’s list price. What I like about this Burroughs entry and Cassidy’s catalog in general is how he lets each item’s bibliographic and historic details sell the item. The Burroughs entry is long and informative as befits the price tag. Cassidy’s description attempts to justify the price. The entry provides a brief history of Burroughs and Scientology as well as paragraphs touching on the significance of the Beats, the Ginsberg / Burroughs relationship, and the state of the Burroughs manuscript and letter market. For the Burroughs fan, item 15 is a must read. Cassidy knows his stuff. He is presenting a paper entitled, “Distribution Revolution: Methods of Circulation Among the Publications of the Mimeograph Revolution”, in Minneapolis at a conference this summer on the mimeograph revolution. I look forward to reading it. Cassidy’s web site demonstrates another aspect of the personal touch that is returning to rare bookselling in the digital age. Just as Cassidy’s catalog is not just a list of books, his web site is not merely a searchable database. He realizes that web pages need a constant stream of content to keep the eyeballs coming back. There is an updated section of new arrivals as well as a blog that lets collectors get an inside look into the rare book business, read up on bibliographic topics, and learn a little bit about Cassidy in and out of the book trade. Here is Cassidy on the reaction to his catalog and a more detailed look at why he issued his catalog at this moment in time. I think Cassidy will find that images are key. He will get even more hits and sales once he makes pictures of his treasures a centerpiece of his site. If I am any indicator, color images of rarities bring me back again and again to a bookseller’s web page. There is no reason a bookseller’s web page should not be in some respects an image repository. Between the Covers is widely acknowledged to have one of the best bookselling web pages. Tom Congalton is a top-notch bookman, but he is also a savvy Internet businessman. He and his team have created a well-designed look and logo, a bookselling philosophy, and name recognition through magazine articles and speeches. He has rapid turnover of content including a fun and games section that is in the process of expanding. The blog is a nice touch and potentially a valuable resource for information. This element is in the fledgling stages; let’s hope it grows into something special. Cassidy has the bibliographical knowledge and resource to make it so. Cassidy has been selling books in earnest for only two years. More interesting to me is the fact that he is in his mid-30s. The aging of rare book dealers is an area of concern. Go to a bookfair and you will see bookdealers under 40 to be few and far between. From what I understand only a handful of such dealers are members of the various bookselling organizations. Membership in the ABAA for example symbolizes one’s dedication to and knowledge of the book trade as well as a presumption of permanence and stability. Along with Jeff Maser, the presence of two young, knowledgeable bookmen that sell items I am intensely interested in is a cause for celebration. The book trade needs new blood and according to Cassidy (and Cassidy is proof) it is out there. For example, Bob Moore works at Ken Lopez and he oversaw the William Burroughs archive project. This was a major piece of scholarship. Let’s hope members of this new generation start stores of their own. There is a similar trend in rare book collectors. Walking through the NYC book fair, I saw very few collectors younger than myself and I am 35. For years, I have been one of the youngest collectors at these events. I am too old now for that to remain the case if the book trade hopes for a healthy future. Those at the forefront of the book trade understand that the rare book collecting is more than just acquiring a financial asset: it is about acquiring information through scholarship, building fulfilling relationships with the literary communities (including booksellers) of the past, present, and future, and constructing a monument that expresses the collector’s own personality and passions. I think Brian Cassidy gets it. Keep an eye out for his next catalog and check out his website. They have the potential to turn Brian Cassidy Bookseller’s webpage into something worth bookmarking. Written by Jed Birmingham and published by RealityStudio on 5 June 2007. Your point about the age of dealers and collectors is interesting. Do you think that both tend to be older for the simple reason that young people are simply less likely to have the extra income to spend? Also, I wonder to what extent the age stratifications at book fairs derive from the fact that older people have already established the habit of attending them, whereas young people are more likely to buy online? July 1, 1985. Somehow, the letter is already for sale again at http://www.lionheartautographs.com, and the letter can, at present, be seen on that website. (You can print yourself a copy.) The letter talks directly about poetry and writing and Burroughs’ style is evident. Lynn Andrews was shocked when I told her a few weeks ago that I had Jeff Maser sell the Burroughs letter. However, I’ve studied poetics for the past five years with Diane di Prima in San Francisco, and Diane has said that sometimes its important to move the art around. Thanks again for your work. In the spirit of moving art around, please know that I have a new book of poems out, “Kit Fox Blues”, with an introduction by Diane di Prima, from di Prima’s press, Eidolon Editions, SF 2006. On July 3rd one of the most anticipated sales of autographed letters will go up for auction at Christies. This stuff is absolutely incredible. If you were a major thinker or writer after the Renaissance you were included in this collection. Taking a look at the estimates is interesting in light of the Burroughs letter under discussion above. $20,000 can get you some incredible stuff. I love Burroughs but I find it hard to believe that as a collectible the Scientology letter is in the same class as some of the writers and thinkers available here. A Burroughs letter to Ginsberg from the 50’s yes but not a later example. Judge for yourself. That auction of letters has incredible material — Baudelaire, Novalis, Kleist, Kafka, a handwritten poem manuscript by Rimbaud. Like you say, it’s hard to uphold the valuation of that Burroughs letter in comparison. Then again, maybe it’s a sign that Burroughs’ reputation still has lots of room to grow?